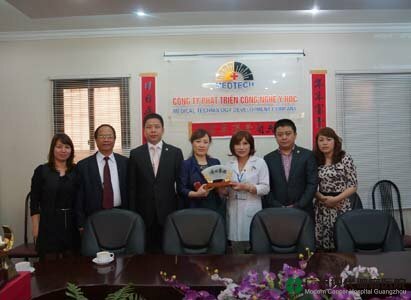 In the afternoon of Feb. 28, 2013, the delegation lead by Chairman Lin Zhicheng of Boai Medical Investment Group was invited by Director Nguyen The Hung to Trang An Hospital for medical inspection and cooperation discussion. The delegation including the General Manager of Zhejiang District of Boai Medical Group China Su Yuanfang, Deputy General Manager of Vietnam Chen Cuiqiong, and Manager of Hanoi Office of Modern Cancer Hospital Guangzhou. Director Nguyen The Hung introduced the prospect and market position of Trang An Hospital in the conference. Refering to cancer treatment, Chairman Lin presented to Director Nguyen The Hung and others the cancer treatment technology: combination of traditional Chinese medicine and western medicine in minimally invasive target therapy from Modern Cancer Hospital Guangzhou, a subsidiary of Boai Medical Investment Group, as well as the remarkable achievement the hospital has made in treating cancer. As more and more Vietnamese cancer patients came to China for treatment in past few years, Modern Cancer Hospital Guangzhou has helped many cancer patients of mid or late stage control their condition and improve living quality, from whom including Mr. Tran Thanh Tung, Mr. Dinh Quang Hong, Mr.Bui Thi Thi, Mr. Nguyen Van Tinh, Mr. Nguyen Hong Ha, Mr. Vu Xuan Hoa and so on. After the presentation from Director Lin, Director Nguyen The Hung agreed with the medical perception of Boai Medical Investment Group and highly praised the leading technologies, excellent medical talents and internationalized medical service of Modern Cancer Hospital Guangzhou. Director Nguyen The Hung said, he expected the cooperation between the two parties and hoped to set up a cancer hospital with Boai Medical Group in Vietnam, so the leading cancer treatments can serve more patients. After the conference, Chairman Lin presented a souvenir to Trang An Hospital, and Director Nguyen The Hung accepted this special souvenir and took a picture with the delegation. On the evening of Feb. 28, Deputy Director of Medical Administration of Vietnam Health Ministry Nguyen Trong Khoa, Managing Director of Legislation Bureau of Vietnam Health Ministry Nguyen Huy Quang, Managing Director of Medical Quality Supervision of Vietnam Health Ministry Vuong Anh Duongm, Director of Federal Office of Public Health Nguyen Khac Hienm, Director General of Medical Affairs Bureau Tran Thi Nhi Ha and other officers met the delegation in Ha Noi Hotel and had a deep conversation about the medical condition both in Vietnam and China. Director Nguyen The Hung of Trang An Hospital first delivered the speech to affirm and praise the medical technology of Modern Cancer Hospital Guangzhou in the conference. 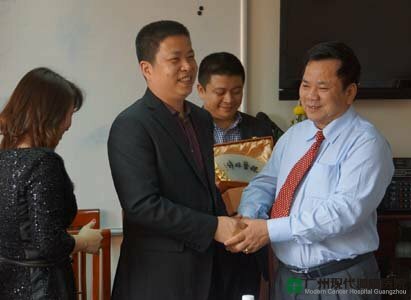 He again expressed the will to have medical cooperation with Boai Medical Investment Group. The representatives from National Health Bureau also said that the medical technologies of Vietnam is rapidly developing and hoped to strengthen the medical cooperation between two parties, which will contribute to the health industry of Vietnam greatly. The financial aid given by Modern Cancer Hospital Guangzhou to Nguyen Van Da, a cancer patient from Hanoi in 2012 impressed them very much, the representatives of Health Bureau added. This issue, which reflected the boundless love of the hospital and made them deeply feel the skilled medical technology and humanistic medical service, had improved Vietnam-China relations and medical communications. The Health Bureau said they welcome Boai Medical Investment Group to help Vietnamese people and hope Boai Medical Investment Group can promote the advanced medical technologies to better serve patients through investment in local cancer hospital or cooperation with Vietnamese medical institutions. Chairman Lin also expressed the mind of medical investment in Vietnam during the talks. 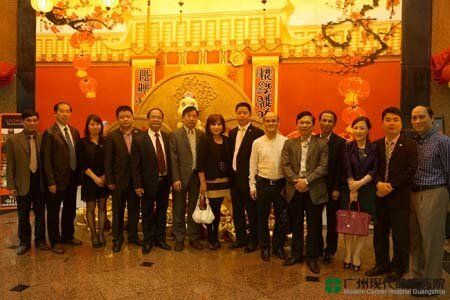 Boai Medical Investment Group and Trang An Hospital had primarily reached the same opinion in cooperation. Through the activities like cancer club and health lectures, Hanoi Office of Modern Cancer Hospital Guangzhou has conveyed more cancer knowledge to Vietnamese people about cancer prevention. It is believed that Boai Medical Investment Group and Modern Cancer Hospital Guangzhou will provide the local patients more qualified medical service in the near future.